If you’re searching for the amazing horse jewelry gift that will take her breath away, you’re in luck. Personalized jewelry is a fashion classic with timeless appeal. When it’s well-made, using only the highest quality gold or silver, by a talented jewelry artisan, personalized jewelry often becomes a person’s favorite piece of jewelry – something they wear every day, with pride. That’s certainly the case with our signature Custom Nameplate Bracelet. Our customers who already have this bracelet love it – and many of our customers who don’t have it have told us they want it! 8 plates of 14K gold are linked to form a beautiful, classic bracelet. Each plate can be engraved. It’s a great way to celebrate your horses, your children, your grandchildren – anyone you hold near and dear in your heart. If you have a favorite saying or motto that’s 8 words long that’ll fit too! Someone in the barn recommended “Don’t forget to buy more grain and apples!” but as you can imagine, we don’t let the horses make all the fashion decisions around here! Some people love silver more than gold! 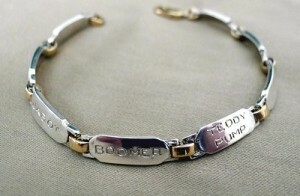 For those people, we present the Handmade Nameplate Bracelet in Sterling Silver. Seven contoured sterling silver plates are joined with golden links for an incredibly beautiful bracelet. This makes it ideal for the 7 to 7 1/2″ wrist: more plates can be added if you need a larger bracelet. 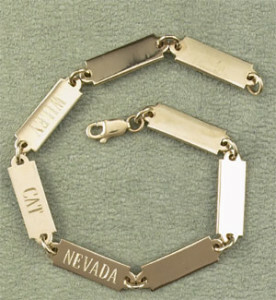 The engraving is hand done on this piece, a very high-end approach that makes this bracelet truly a superlative gift. Our customers who already have (and love!) this bracelet always remark on how sturdy and well-made it is. This is a bracelet you can wear confidently. It’s always in style, and looks great with everything, from the most casual outfit to elegant evening wear. It’s a fantastic way to keep the names of your nearest and dearest with you always.